I arrived here in Nice on Tuesday and have been spending the past few days getting formally acquainted with the city. I’ve been to this part of France on a few holidays over the years, but the packed restaurants and bars and the stretches of eerily blue water feel a bit different now that I’m here for the foreseeable future not the immediate present. My Englishman was waiting at the airport to greet me when I arrived and we have been filing our days with activities, trying to squeeze as much in as we can before he heads back to the Middle East in a few weeks. Nice has a huge arched stretch of beach and a lovely wide promenade wrapping around it, but it’s a very pebbly sea front, so we’ve been taking the train a few stops east along the coast to Villefranche Sur Mer, a gorgeous little beach town with bright colored houses and villas built up into the steep mountain side and much sandier shore. We rented a little motorboat and spent one afternoon exploring some of the coastal towns further to the east, dropping our anchor among the many sailboats and yachts off the coast of Saint Jean-Cap Ferrat another picturesque town known by some as a more tasteful, and by no means less moneyed alternative to Monaco. I am off to a good start here in France, but the journey hasn’t been without a few bumps along the way. After a few too many pichets de vin the other night, I finally saw a little glimpse of the emotional breakdown I have been anticipating. As I was packing up a suitcase to take on our upcoming trip to Corsica, I felt a sudden deep pang of homesickness, and before I knew it, I had tears streaming down my face. Some of the enormity of what I’ve done seemed to dawnn on me in that moment and I felt a very long way from home. When the Englishman departs in the not so distant future and I am really on my own, I foresee that feeling of loneliness will return. But for now, I am off to explore the wild craggy vistas of Northern Corsica, and trying to take things one day at a time. 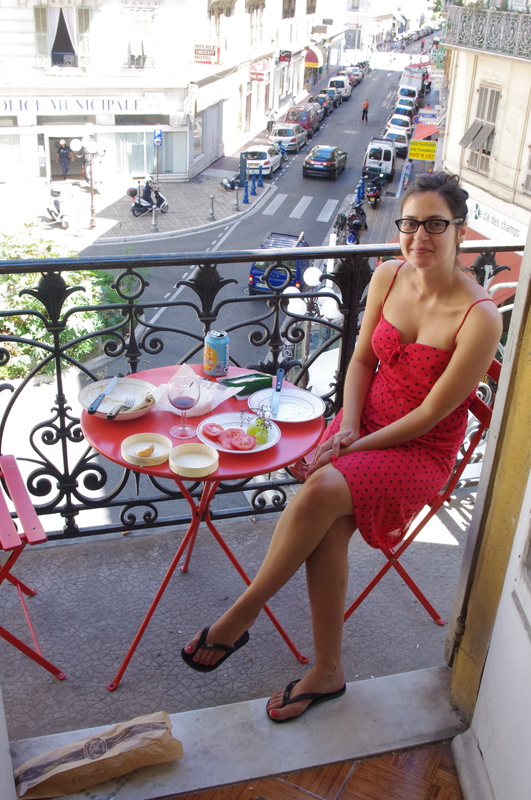 The apartment where I’m staying is a five-minute walk from the main strain station in Nice and has two little balconies overlooking a small roundabout, lined on each side with slightly seedy hotels and a wide selection of restaurants. I love sitting, watching as the restaurateurs set up for the evening, and seeing the tourists and locals go past, and I wonder how long it might take for me to bridge that divide. If I don’t want to get lonely, I’ll have to learn more.